Native Instruments are back! Today NI announced a whole new line-up of hardware and software including the highly anticipated Komplete 12. These releases signify a move to make their ecosystem more accessible for all types of users, from beginners wanting to make their first beat, all the way through to serious producers and sound designers who demand the best sound quality and the most diverse content to cover all genres and styles. Well let’s start with the Komplete Kontrol S88 MK2, the Komplete Kontrol MK2 range was released last year with the 49 and 61 getting the facelift with a fresh new professional look and vastly improved UI. But the 88-note flagship weighted S88 was left sadly left behind, until now! The S88 has now undergone the MK2 treatment; it now features the two screens for navigating your presets and managing your parameters, it features the same super high quality FATAR weighted keybed as it's predecessor, capacitance encoders, light guide, deep Komplete integration, full NKS support, after touch and physical pitch and mod wheels plus more of the features which the MK2 range has become so well known and respected for. So if you’re after a truly expressive, fully weighted keybed with NKS support, deep DAW integration and the best integration with your Komplete library, then there’s no better option than the S88 MK2. Next up is the new Komplete Kontrol A Series, a price conscious take on the aforementioned Komplete Kontrol series. Available in 25, 49 and 61 note variations the A Series represents the very best of NI’s hardware innovations in a more affordable package. 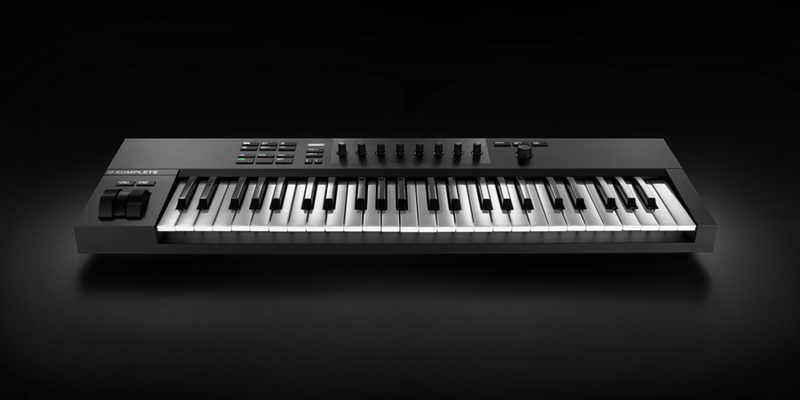 The A series retains the super slick navigation, encoders and form factor of the Komplete Kontrol S range, but it forgoes the dual screen layout and opts for a high resolution OLED display, USB MIDI (no Din MIDI) output, plus a custom keybed designed specifically for NI and this range, which feels almost identical to the FATAR keyboards from their premium lineup, providing the same positive, quality feel you're used to. This new range allows users to access NI’s ecosystem of Komplete instruments, effects, NKS and superb DAW integration without having to invest into a premium keyboard. If you’re happy using your computer screen to navigate your software library and you don't need the light guides, then the A series is just the ticket. A Series is NI quality at a price point you wouldn’t expect. Each A Series keyboard ships with Komplete 12 Select and Maschine software with 2GB of content, meaning you can get right to work making music, right out of the box. 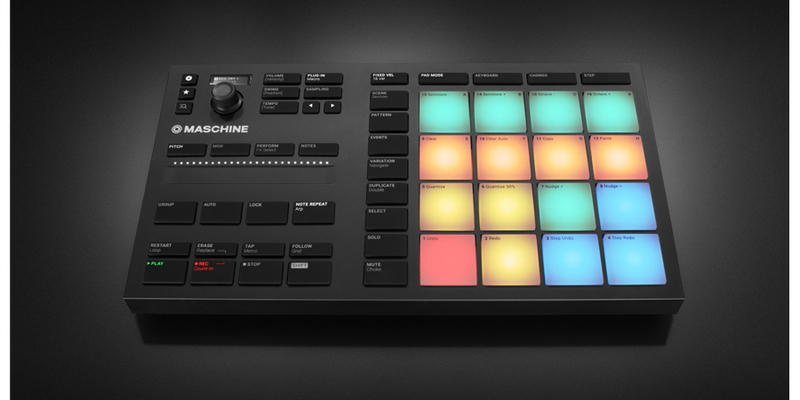 Maschine see’s its first hardware addition since the highly successful Maschine MK3 with the announcement of Maschine Mikro MK3, a brand new take on the Maschine Mikro Groovebox. In the style of the A series keyboard lineup, Maschine Mikro forgoes it’s bigger siblings colour screens, and opts for a more subtle, yet highly usable OLED display. All of the mod-cons from MK3 have been carried over to the Mikro MK3, the up-rated and enlarged RGB pads, the touch strip, lightening fast browsing and super slick step sequencer, but the overall size has been slimmed down into a Mikro chassis, making it great for a portable setup, a second controller for more advance beatmakers, or a quality step sequencer for your DAW environment. Playing the pads on the Mikro, you instantly notice that they are IDENTICAL to the MK3, with all the bounce, snap and response you expect from an NI pad, with just enough squish in them to make pressure based effects and beat repeats accurate and effortless. During the RND process of designing the Mikro, NI digested and analysed all of the most commonly used shortcuts and actions used by maschine users to dial in the perfect workflow within the restricted space the smaller chassis provides, so there’s less shift commands and menu diving than ever, but it’s super simple to build your perfect groove. So for aspiring beat makers, finger drummers and producers wanting an affordable yet incredibly high quality hardware solution to their beat-woes, the Mikro MK3 is a serious contender. Mikro MK3 ships with Maschine software and includes thousands of sounds, so you’re sure to never dry up for creativity. Just tell me about Komplete 12!!! Well this is the biggie isn’t it? Of course, EVERYONE knew it would eventually come but in true NI style they’ve really outdone themselves this time around, squeezing in more content, instruments, effects and now expansions than ever available in any other version of Komplete. In Komplete 12 there are even more tools available at your disposal than ever before, with a whole host of new instruments, effects and some revamps of some world class classics, such as the genre defining Massive and Kontakt which have been upgraded to Massive X and Kontakt 6 respectively. Komplete 12 Select, your entry point into the Komplete ecosystem. Bundled with a variety of NI hardware, this essential software collection is also available separately and provides you with 45GB of sound content, instruments, samples and more to get any enthusiastic songwriter off the blocks. Updates to the full versions are also available further down the line. Komplete 12, the industry standard software instrument platform returns. 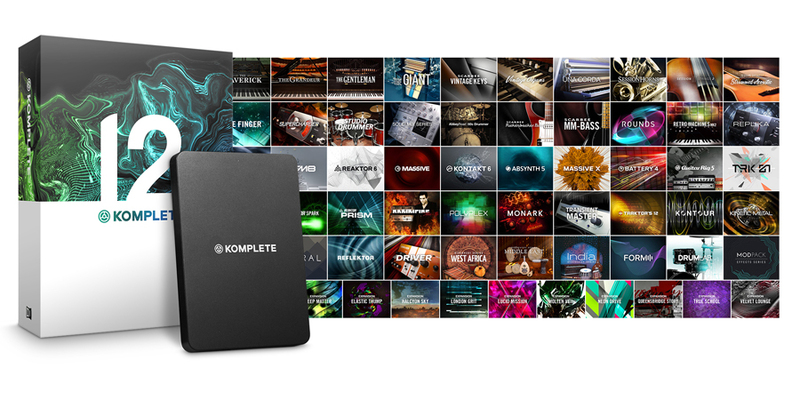 With over 50 instruments and effects and 220GB of content, Komplete 12 is the perfect tool to get the music in your head out into the real world. Komplete 12 Ultimate, Ultimate by name, Ultimate by nature. A breathtaking collection of the creme-de-la-creme of NI's software titles. The package if you're looking for deep synthesizers, beats, samplers, pianos, bagpipes (remember that!? ), strings, orchestral, modular and so forth. 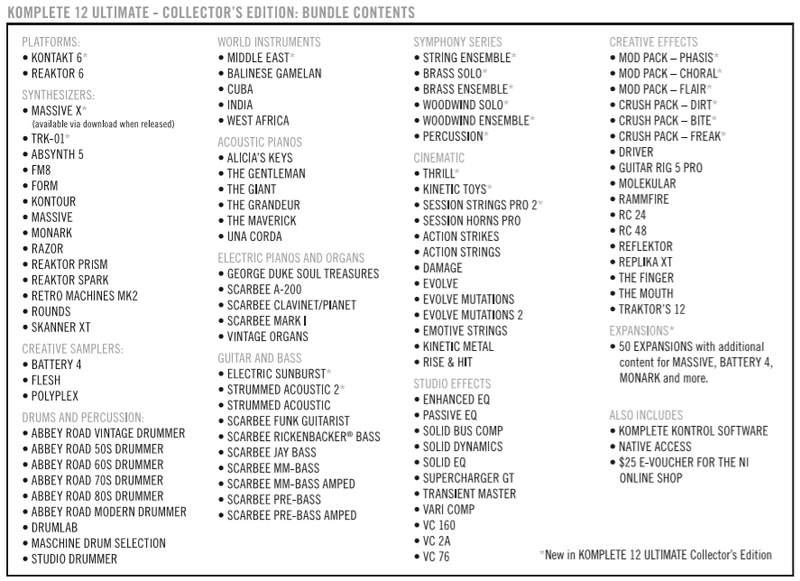 Komplete 12 Ultimate Collector’s Edition, a completely new version just for the release of version 12. The Ultimate Collectors Edition is for the VERY serious producer who simply needs any conceivable sound at their fingertips at any one time. 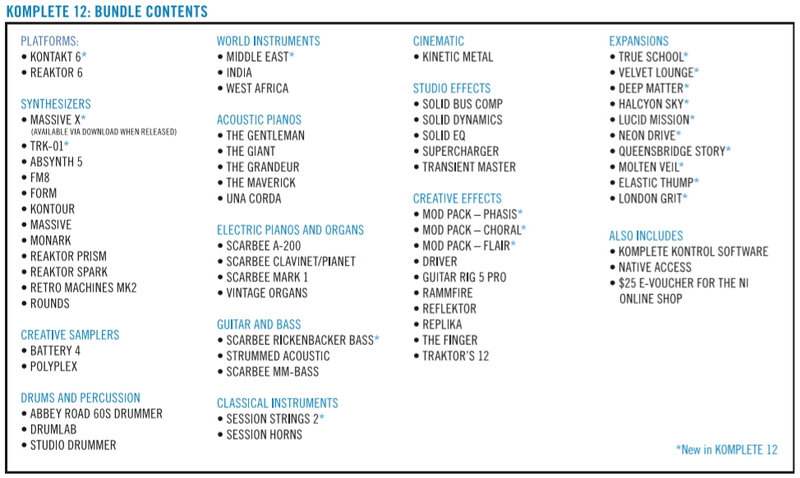 It includes everything from Komplete 12 Ultimate (as above), but it also includes all of the Symphony Series, Creative Effects and Expansions that were released between 11 and 12, making it the most cost effective way of owning the largest collection of NI titles, in one package....just look at it. System requirements are below and are the same throughout each version, it’s just the hard drive space you need to budget for, and at a whopping 990GB for Komplete 12 Ultimate Collector’s Edition, you better get the 2TB SSD sharpish, because you’re going to run out of room! And with any Komplete release there's opportunities to get very favourable prices on upgrades from your current version, or if you're not to NI & Komplete you save £££'s when you buy with a hardware bundle, by upgrading the included version of Komplete Select to your desired Komplete version. All of this fresh new hardware is set to ship in 2018, with some software and hardware coming as early as next month, so give us a call to see what NI hardware is the best fit for you and your projects. For more information about Native Instruments speak to our in store specialists (and NI users) Li Daguerre and Tom Lewis.